Health Projects International Pty. Limited (HPI) is an Australian based company working throughout the world, specialising in the planning, design and commissioning of Hospitals, Day Procedure Centres, Medical Centres and other Healthcare Projects. Working with Australia’s Leading Healthcare Architects, Health Projects International (HPI) our team were commissioned to create a 3D Photomontage for council to assist in the development application (DA). The project had many significant requirements which required methodical practices and documentation of our process for the council and tribunal processes required to get this project over the line. 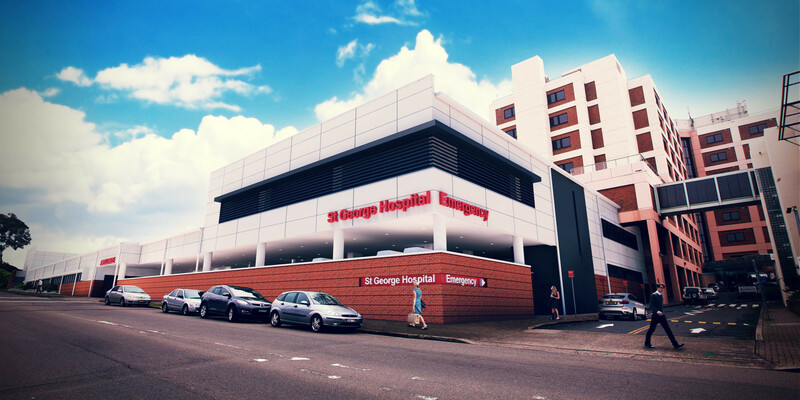 To ensure accuracy our team undertook several 3D Photomontages, professional photography was undertaken to capture the correct aspect required providing the necessary backdrop for the new emergency department to be superimposed. Our team must then match the perspective of the camera by matching where the photography was taken from, the kind of lens and the distortion in the image to then match the supplied 3D Revit Model over the photograph. This part of the 3D photomontage is time consuming as often elements of the photo need to be matte painted to add or remove unwanted or required details such as existing trees, buildings, cars etc. To ensure the 3D Photomontage looks realistic the lighting must also be matched and due to time and weather constraints unfortunately we had to deal with an undesirable overcast day. Whilst better weather would of make our image look substantially better our experienced team were still able to improve on details and replace the overcast sky to provide a much nicer result.